Ever felt uninspired in the kitchen since all of your recipes have been so tried and tested that you just feel like everything’s unexciting? We all feel that way from time to time. Let’s be honest – there’s a limit to how often you can make macaroni and cheese or your much-beloved casserole, no matter how delicious it is. So how to revamp your inspiration and bring some excitement to the dinner table? By finding inspiration from great cookbooks, of course! Bookstores are filled with hundreds of books that all seem tempting, but how to choose the best of the best? How to find that one cookbook that gives you the inspiration you need? We did some digging and found 10 cookbooks that are insanely popular – even so that many of those cookbooks have thousands of positive reviews on Amazon. Take your pick from any of these 10 and you can be almost sure you’ll find tons of cooking inspiration. Even more, many of these cookbooks feature quick healthy recipes that will solve your dinner problems with ease! This cookbook is a true revolutionary that gave busy moms the much-needed ease of cooking thanks to simple and quick recipes. The author Ree Drummond is also known for her Food Network show “The Pioneer Woman” and several other cookbooks. 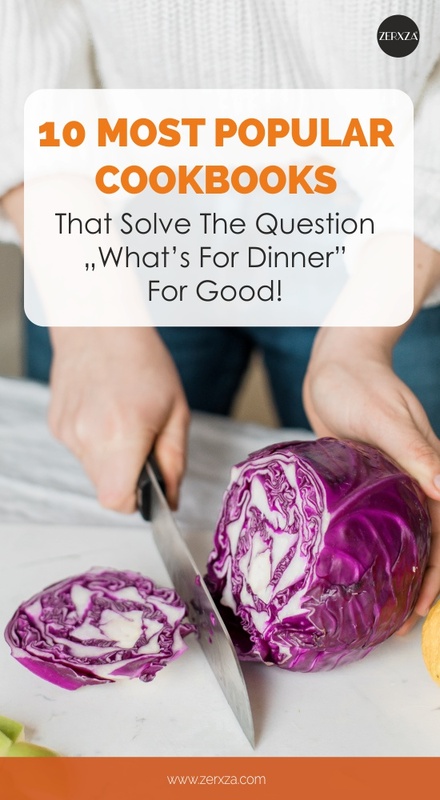 The “Dinnertime” edition which has over 7000 reviews on Amazon features more than 125 simple recipes that take no longer than half an hour to prepare and are almost certain to put an end to the question “what’s for dinner”. The title of this book isn’t the only interesting part of it. Thug Kitchen is known for its realistic approach to diet and nutrition – no pretentiousness. The book approaches healthy diet and cooking from a humorous angle, bringing a very realistic approach to cooking vegetarian food. That approach is the exact reason why Thug Kitchen’s book has been praised by thousands of people – even those who’re not vegans. If you’re tired of boring cookbooks with too complex recipes, this might be the option for you. Among all the new diets that have emerged within the last 10 years, Whole30 is one of the most popular as also proves this cookbook which has over 3000 reviews on Amazon and is also one of the New York Times best-selling books. Melissa Hartwig’s program is one of the most known diet programs these days, helping thousands of people improve their life and health. If you’ve been looking for a new dietary regimen to follow, this book might be a perfect choice, especially as it promises to break unhealthy diet habits within just 30 days. Instant pots are all the rave now since they make your kitchen life so much easier – easier food preparation, less hassle and more time for you to spend on other things besides sitting behind the stove. This book is by far one of the most popular instant pot cookbooks that features over 100 easy recipes for both vegan and paleo diets. As one reviewer said: “This Instant Pot cookbook has everything you need to know to use your Instant Pot”. If you’re an Instant Pot enthusiast, this cookbook could be the perfect addition to your cookbook collection. Have you ever thought cooking is exactly like chemistry? This book takes a scientific approach to preparing your favorite meals and delves into how heat, energy, and molecules interact to create amazing food. All food items have a different composition, but things change when you cook them – and depending on how you cook them. The Food Lab is an eye-opening cookbook that goes far beyond just mixing together delicious ingredients – it makes you understand what’s really happening when you cook. It’s no secret that a plant-based diet is widely popular for various reasons, starting with health. This cookbook thrives on the same philosophy and introduces the wonderful world of plant-based food in a great way. There’s something for everyone: starting from pasta dishes and grilled vegetables, ending with delicious desserts. The only downside of the book seems to be the complexity. Several reviewers have stated that many recipes include a long list of ingredients and tend to be quite complex, so it might not be the perfect choice for busy moms. However, if you’re just looking for some inspiration, this book might be ideal for you. Low-calorie double chocolate chip walnut cookies? Yes, please! It’s safe to say that losing weight has never been so fun as with this cookbook! Many recipes are tailored for bigger families – like families of four or six – but what if you’re just living together with your partner? Or perhaps you’re a single parent? Cooking can be complicated if it’s just the two of you. This cookbook makes things a LOT easier! This simple cookbook covers more than 600 recipes that are all tailor-made for two portions. Besides great recipes and nutritional information, the book includes clever cooking tips and tricks that make the whole cooking process smoother. If you have a two-person household, this book will definitely make your life in the kitchen easier! Oh, food cravings. We all have them. And sometimes we hate them. Chrissy Teigen, however, welcomes cravings with open arms and gives you all the recipes you need to tackle those cravings. Want something spicy? Something salty? Something juicy? You got’em! Perhaps the best part of this cookbook is the fun approach. Cooking should be, after all, fun! Learn to love cooking with this great cookbook that lets you enjoy great food and a bit of laughter. This New York Times Bestseller is authenticity in its finest, celebrating friendship, family and traditions. Magnolia Table features recipes for the whole family, but most importantly – focuses on home-grown ingredients and seasonal produce. If you’re looking for a cookbook that includes American favorites like chicken pot pie, chocolate chip cookies or lemon pie and you love authentic personal approach, this high-rated book is the one to choose!